The Kids Made Me Fat: From the Road....Fireworks. In order to vacation, I must spend hours laundering, organizing, packing and readying the house for our departure. Vacationing requires Justin to pack one bag and get in the car. Justin: I spent $75 on fireworks. I'm bringing them to Michigan. Me: What the hell Justin?!?! Do you think you make so much money that we have enough to just set it on fire? Justin: It will all be worth it to see their faces. He is referring, not to the faces of our children, but rather to the faces of Angie & Ryan Wood, who live in Michigan - where fireworks are illegal. However, the way Justin justifies spending the money, youd think he was delivering food to the starving. Justin: Damn it!!! Oh no!! Justin: I forgot the fireworks. We HAVE to stop and buy more. Then my head exploded. Ka-f#cking-Boom. 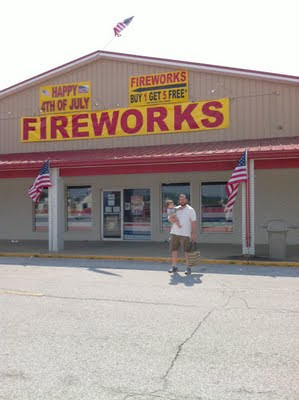 Justin and Jack outside a fireworks store in Martinsville, In. Shortly after this photo was taken, Jack puked all over Justin - so he was forced to strip down to his white tank top (where I come from, this is called a wife-beater). 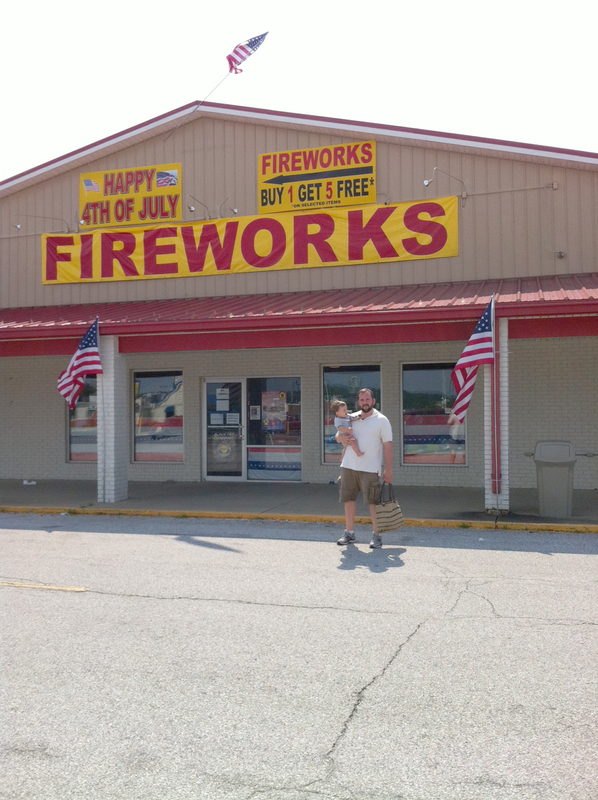 While shopping in the fireworks store with my husband wearing his wife-beater, the girls started whining for food....And that is how we found ourselves sitting in a Long John Silvers with Justin in a wife-beater holding his bag of fireworks....God Bless America.